A nostalgic look at a typical Five & Dime from the 1950s and 1960s. A fun book for all ages. A nostalgic look at a typical Five & Dime from the 1950s and 1960s. For those of you too young to remember, the Five & Dime was the precursor to super stores like Walmart and Target. Small town America at it’s best–you could buy fabric, cards, notebooks, fantastic toys, shampoo and a myriad of products plus, get a soda or root beer float at the lunch counter! A fun book for all ages. 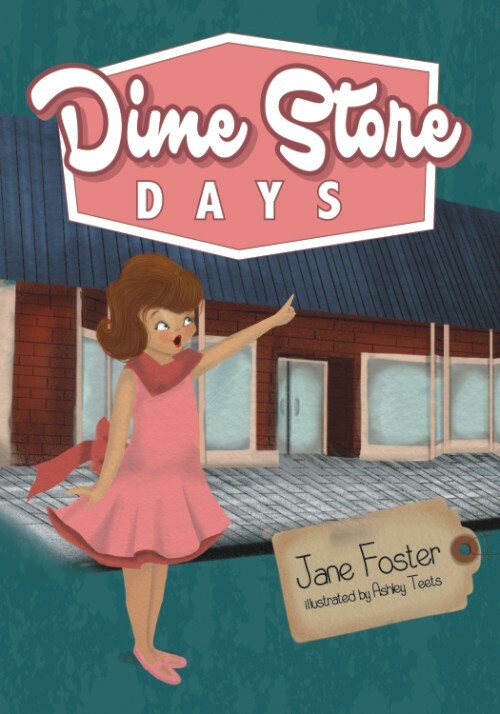 In Dime Store Days, Jane Foster takes us back to a simpler time when folks would socialize and shop at their local Five and Dime. The book is based on a real store, as one of the comments at the beginning of the book shows: “I… recall taking my children to Clark’s Dime Store on many occasions.” The story is told in rhyme: mostly AABB, though a couple times you get an ABACC (for those of you who pay attention to that sort of thing). The illustrations are much in the style that you would see in books of the era of the Five and Dime – sweet children, tall and slender folks, ’50s hues. A lovely little book overall. The cover of Jane Foster’s book, Dime Store Days, really grabbed my attention when I saw it. The cover reminded me of the type of books I read at my grandparents’ house as a little girl. Ashley Teets sure did a great job bringing the book to life, both on the cover and inside Dime Store Days. The story was easy to read. I really appreciated the rhyming factor. There were a couple words I had never heard of before, but that only added to the quaintness of the tale in a charming way. Between the amazing descriptions by Jane and the colorful illustrations by Ashley, I felt like I was back in time, enjoying all the sights, sounds, and tastes of that little Five and Dime. I think this is a great book to show to older relatives/friends to get them to reminisce about their earlier years, as well a tool to teach the younger generation about days gone by.